SS Bismark / Majestic II liner launched in 1914, history and images. The Hamburg Amerika Line’s Bismarck was the world’s largest ship until the French Line’s 79,280-ton Normandie entered service in 1935. She took the title from the Hamburg Amerika Line’s 54,282-ton Vaterland that entered service in May 1914. As Bismarck was launched after the outbreak of World War One, work on her fitting out had to be suspended until the conflict came to an end. The German surrender in 1918 led to Bismarck being awarded to the White Star Line as compensation for the sinking of their liner Britannic. A workforce of 1,200 workers at the Blohm & Voss shipyards was then assigned to complete Bismarck under supervision of British armed forces. 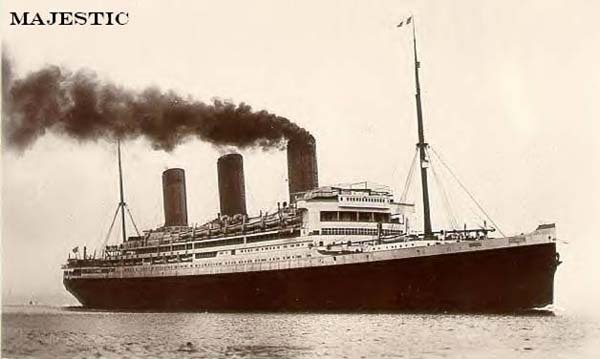 After being delivered to Britain in February 1921, the White Star Line renamed her Majestic. Being the largest ship in the world at that time, Majestic received vast amounts of free publicity and became extremely popular as a result. She could carry 750 1st, 545 2nd and 850 3rd class passengers. The White Star Line operated Majestic on the Southampton - New York run alongside their 45,324-ton Olympic and the 35,000-ton Homeric (another German built ship awarded to the White Star Line). During the depression of the late 1920s /early 1930s, the White Star Line operated Majestic on cruises out of New York, often cruises to nowhere, just to allow the American public to escape the prohibition. At that time, foreign ships were allowed to sell alcohol when they reached open seas. These short excursions soon became known as booze cruises. 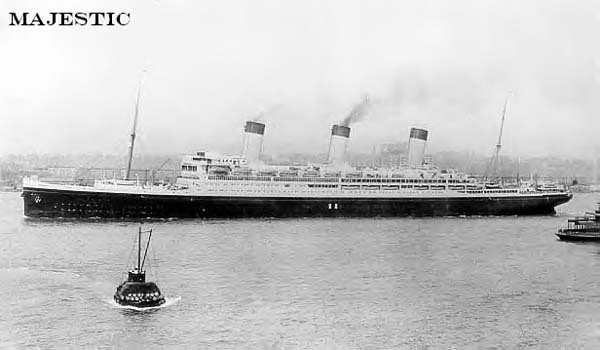 Majestic was one of the ships marked for disposal after the Cunard/White Star merger in 1934. In February 1936, after only 14 years in service, she was laid up at Southampton while arrangements were made for her disposal. Three months later, T W Ward L T D bought Majestic for scrapping. Her funnels and masts were cut down at that time, as she had to pass under the Firth of Forth Bridge/Scotland on route to the scrap yard. The British Admiralty saved Majestic from being prematurely dismantled when they bought her to be operated as a training ship. She was then based at Rosyth/Scotland under the name Caledonia. The British Admiralty planned to operate Caledonia as a transport ship during World War Two. Before that new role began, she mysteriously caught fire and sank at her moorings September 29th 1939. The completion of the salvage operation in March 1940 showed Caledonia was beyond repair. After being dismantled to the waterline at Rosyth, her remains were towed to Inverkeithing for the scrapping to be completed. The creator of the Big Three, Imperator, Vaterland and Bismark was the Hamburg Amerika Line’s managing director Albert Ballin. He became an influential politician involved in negotiations to end World War One. With the terms of surrender leading to uprisings throughout Germany, Kaiser Wilhelm fled to the Netherlands November 9th 1918 and Ballin committed suicide.